I'm loving the details to Lem's new look. The musical notes on the dagger is a beautiful touch. I'm therefore actually having some trouble parsing any changes to his new look, 'cause I barely recalled his old one- but I like the piece well enough. Good cocky eyebrow quirk there. I LOVE dual-purpose halfling equipment! Also, notes on Lem's gladius? That's genius. (So, halflings have a somewhat triangular head shape this time around, isn't it? Makes them less childlike I suppose). I like this version of Lem quite a bit. I believe it's the first PF2 art I can say I completely and unambiguously prefer to the original in every way (I usually prefer them for the most part, but not every little thing). I thought the original was fine, mind you, but he looked vaguely too...non-serious, maybe? The new version looks more like someone not to be trifled with, which is very appropriate given his backstory. At first, I was quite pleased at the “stay tuned” pun, but then I realized that’s just how all the Iconic Evolutions have ended so far. So while I love all of Wayne's art so far, I think ive finally figured out what's messing me up. They all have this odd pose where their legs are super wide and they have virtually no shoulders unless you go looking for them, and then once you do, you realize they have an excessively long neck. I feel like it's an intentional choice,as looming at each one they all seem to be doing this, and it makes me stare at them until I can figure it out. And it doesn't look bad either, they all look nice and crisp and clean. But when i look in at details, my mind breaks as I wonder how I didn't see it sooner. I think that's just a perspective thing, with us basically looking up at them at an angle, but yes, their shoulders are narrower than their hips due to it. But I'm not seeing the neck thing at all. I rather like that one of the maces looks like a rolling pin, & that the hammer looks like a meat tenderizer! *Edit: From the concept art in the YouTube video. 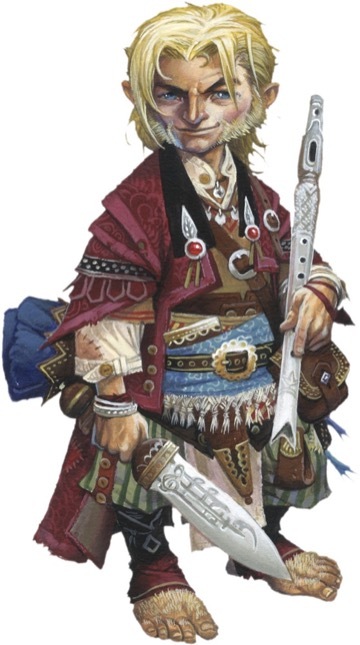 Also, this version of Lem looks less like a vagabond than the 1E version. *Looks at Halfling gear* I LOVE it! Especially the shield cooking pots! Is it just me, or does he look like Hugh Jackman cosplaying as Lem? I like the art, don't get me wrong, but it really looks like Wolverine to me. I do like most of the Halfling gear, but that spiked rolling pin-mace and the pepper-grinder club are a bit too goofy for my tastes. I'm thinking it'd be best to move on past the whole "Halflings just like to eat." thing. Lem's sword is now even more obviously gladius inspired, which is kind of neat. He's also buttoned up his shirt, which does give him a more serious look, rather than the slight Disco vibe I get from the old picture. The muttonchops are more prominent, which makes him look older and again more serious. 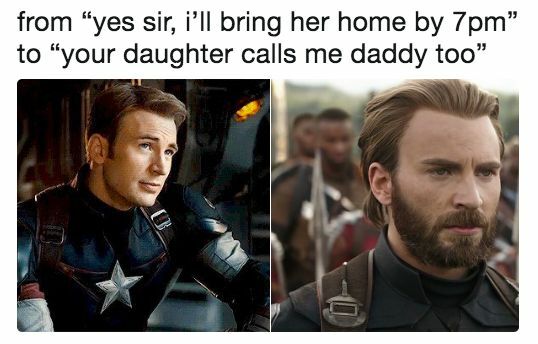 In general he just looks less boyish. While I know the iconics don't really age, he does look like he could be 10 years older. Nope, they've all adopted the "Tory Power Stance". It's a bit odd for sure. I like the changes to the face here, it makes him look less like a weird creature and more like a tiny adult. His clothes look less detailed or more smudged, but I think that's just the color and shade changes again. The anatomy could purposefully be a little off, after all Halflings aren’t supposed to just be little Humans, or at least not anymore. Paizo has been going out of its way to make its races and creatures look a bit more distinct this could be an example of that. Lem's got quite the smolder going on. Lem looks like The Storyteller from the Jim Henson show. Which is very appropriate as a bard! So, when do the new avatars come online? I am immediately reminded of this. And that flute looks like a weapon. Got to admit, it would be pretty awesome for a Halfling having some kind of biomechanical archetype of Shifter (or whatever this gets incorporated into in Pathfinder 2nd Edition) to suddenly sprout adamantium claws from both hands and feet, like Laura/X-23. While I love the engraving on the dagger I miss the old flute, had a much more fantastical look to it. I also like his coat overhaul. All of the non/demi-human Golarion ancestries (Dwarf, Elf, Halfling & Gnome) now have non-human proportions and facial features, as befitting their role in a high fantasy setting. Whilst they're similar in appearance to humans, the proportions for non/demi-humans differ slightly from normal human proportions. This helps to create a richer visual diversity within the game. It also helps to distinguish the difference between Golarion ancestries from their counterparts in other IPs/brands. Golarion ancestries don't just look like tall humans with pointed ears or small humans with large hairy feet anymore. They're so much more than that. Amazing art. Much more charismatic. I particularly like the full clothing, as opposed to the bare chest from before. Definitely a big fan of the "my shield doubles as a cook pot"-style stuff. I wonder if there are going to be mechanics for that? "You can integrate your mess kit into your other equipment, but any damage to your shield makes it harder to prepare a meal," etc. But more seriously, I rather like this new look. Curious to see what they'll do to gnomes & elves to push their 'non-human-ness'. I don't mind different looks for each race (I really love Golarion elves) but this should have been done in PF1 !! First iconic where I definitely prefer the original art. Even though this one is very well done too. And yes, smallest showman on Earth / Golarion. Getting high quality art, and a metric crapton of it at that, is ANYTHING but cheap. It was done in PF1 to an extent, just not very consistently and not systematically. For example, Merisiel set the elf look to have big, single-colored eyes and being spindlier than humans. But this wasn't consistently done with other artists apparently defaulting back to more generic style elves, even with Merisiel herself. Goblins of course were the most successful of the Pathfinder style races from the early days. I think this art overhaul is about addressing unfinished business. Further refining the looks and trying to make them more consistent. Next week should be Lini. I expect her changes won't be about refining the Gnome look, because I think that's one that has been set pretty well. Not Lini, but I hoped (still hope) to see many hat-wearing gnomes in 2e. The drafts for them were beautiful, and it really adds a folklore dimension to the ancestry. So can Lem use his dagger to summon Dragonzord now? Yep, and combine it with the Dino Megazord to form Mega Dragonzord. Aaaahhhh!!! After 10,000 years I'm free! Now it's time to conquer Golorian! If anything P1 was done on the cheap, as the CRB is like 90% reused art from earlier APs. I have Second Darkness (3rd AP) and a ton of it's art is in the CRB. Remember Paizo was a much smaller company when they started their AP line, just trying to figure out how to keep the lights on after losing the Dungeon/Dragon Magazine contracts. And again with the launch of Pathfinder RPG, just trying to keep the lights on with the launch of 4E and the lose of the OGL. Both the APs and Pathfinder RPG were major overhauls of Paizo's business model and huge risks. P2 is instead choosing to do things right from the beginning because they have the experience and money do to it. It is also worth noting that for PF1 Paizo was a fledgling company trying to market a game as a continuation of D&D. Now they have a lot more going on, including more established canon and a bigger reason to differentiate themselves from D&D as its own thing. Agree completely with posters above: PF1 was a continuation of someone else's work (done brilliantly, as proven by all of us here on this forum and not playing 4/5E). PF2 is Paizo's chance to show they can make their game. And that means making it their art. Gnomes in Hats, seem like a safe bet (as well as a decent band-name: "On April 12th come see Gnomes in Hats opening for Men Without Hats"). Quirky self-expression is a big part of the personality of Golaion gnomes. And hats are a great way of doing that. Lini is a rebel without a hat, but Balazar knows the power of a good hat, and those sketches from the previews seem to indicate hats will certainly be a thing. I'm now picturing gnome spellcasters using big hats with a living compartment for their familiars to nest in. Familiar lodging and a fashion statement in one. However, I have a problem *personally* and all I can see is ** spoiler omitted **. Oh my. Hi, Lem. Wow, that look. He does look like Hugh Jackman, in a very flattering way.